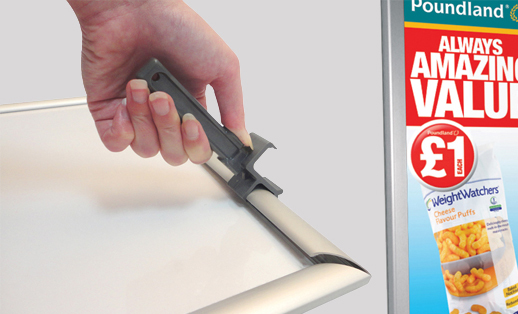 The easy to use action of snap frames offers a fast and convenient way to change the contents of your poster frames. There are times when you want that convenience, but also a little more control over just who can change the posters and advertising materials you put in there. The lockable frames have a small lock requiring a key, and the tamper proof frames include an extra step to the mechanism that stops anyone unfamiliar with the frames from simply snapping them open. Both options mean you decide who can open the frames, making them ideal for public areas such as restaurants, hallways, schools, venues and canteens. Available in a choice of 17 frame colours. The frames are made from extruded aluminium and available with a choice of 17 different stock finishes. The back of the frame incorporates a strong 1.5mm plastic back panel and includes an anti-glare cover to protect the poster or contents. The frames are 32mm wide and available as Lockable or Tamper Proof Snap Frames. Available in sizes A4 through to 60" x 40". It's important that the posters and artwork that are displayed in your frames send the right message to your audience. Our team of professional designers and marketing specialists are here to help you produce the marketing and branding posters that will wow your audience, and really grab their attention. Just give us a call and we'll be happy to discuss just what we can do for you.